Trusted Reviews has tested the JVC PICSIO GC-FM1 pocket HD camcorder. 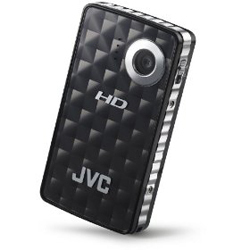 This HD camcorder from JVC features HD video recording up to 1,440 x 1,080 resolution at 30 frames per second. If you want to record at 60 frames per second you can use 720p resolution. The JVC PICSIO GC-FM1 scores 7 out of 10 points in the Trusted Reviews test. The camcorder scores highest on image quality and value while scoring much lower on features. The reviewer was impressed by the image quality that this camcorder is able to produce and the price tag is not all that bad. The PICSIO GC-FM1 has a few shortcomings like fixed fixed length and no manual settings, but overall this seems like a nice little HD camcorder that can fit in your pocket. Read the full review of the JVC PICSIO GC-FM1 camcorder here.